Lateral expansion joints | SPA "Mariland"
The operating principle of lateral joints as angular, based on the ability to bend the bellows. 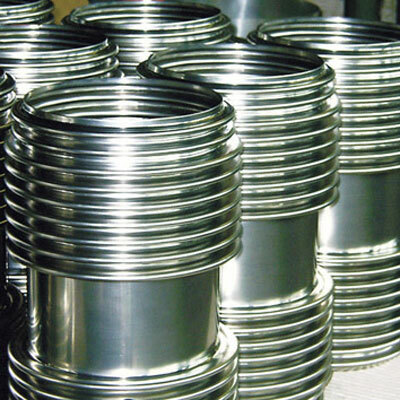 If the magnitude of these shifts is not large, it is sufficient to use expansion joint with one bellows. If the offset significantly large, then it is recommended to use a expansion joint with a double bellows and intermediate pipe between them. If the offset significantly large, then it is recommended to use a compensator with a double bellows and intermediate pipe between them. Amplitude shift (compensation capability) - result in bending two opposite directions bellows connected intermediate pipe. Lateral expansion joints transmit less stress on the support, because, like angular, belong to the pressure balanced expansion joints. Lateral expansion joints are distinguished by their ability to compensate for offsets in one or two directions perpendicular to the pipe axis. Possible to build a system from one corner and a lateral expansion joint. The expansion joint consists of two bellows and the intermediate pipe, equipped with rods, it’s a common type of lateral expansion joint which is able to compensate for the movement in any direction perpendicular to the pipe axis. For high pressure, it is recommended the use of pivot or cardan universal joints with tie rods between the two bellows. Lateral expansion joints can compensate not only the shear deformation, but also significantly weaken the vibration from operating equipment. To ensure efficiency while reducing the length of the section of the projection on the axis of the pipeline when it is tilted (h). SPA «MARILAND» Ltd. makes lateral expansion joints with a nominal diameter of DN 40 to 1200 mm to operate at a nominal pressure of PN 0.1 to 2.5 MPa.